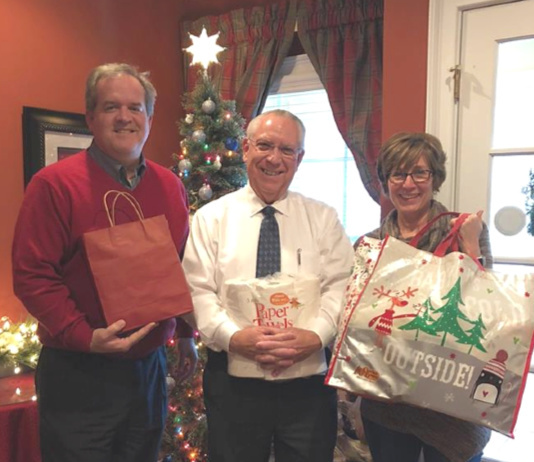 Will Stone and Phil McMullin, financial planners at McMullin Stone & Associates collected paper products to give to Cathy Berggren with the Real Life Center last year. This year, they are collecting again. This time of year we’re excited about the holidays. But they can be hard for individuals and families who’ve fallen through the cracks financially or experienced something devastating in their lives. Fortunately, there are organizations like the Real Life Center, a 501c3 non-profit based in Peachtree City, that provides help for the hurting in Fayette and Coweta counties, giving them the means to cope with the financial, emotional, and spiritual hardships of life. In recent years, McMullin Stone & Associates, a financial planning firm in Fayetteville, has made the Real Life Center one of the community organizations they support annually. This season that includes organizing two separate collection drives, one for food held during October and another for paper products and toiletry items that continues through December 31. 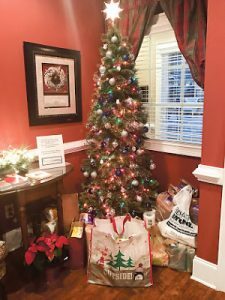 Anyone can contribute to the drive by either coming to the McMullin Stone & Associates Open House on Thursday, Dec. 13 from 4-7 p.m or by dropping off items at the office through the month of December. “By collecting items throughout the month, we thought we could open it up to even more people in the community, to raise awareness of the needs that often go unnoticed,” says Stone. The need for paper goods and toiletries is especially high because those items often can’t be purchased with food stamps, Berggren says. The best thing in the world, Berggren says, are the thank-you notes the Real Life Center receives every day from clients about what a difference the organization has made in their lives. Berggren is especially thankful for the support the Real Life Center receives from McMullin Stone. Holiday Joy: An Open House Celebration will be hosted by McMullin Stone & Associates on Thursday, Dec. 13 from 4-7 p.m. at their offices, 101 Devant Street, Suite 903 Fayetteville GA 30214 Light refreshments will be served. Donations of diapers, feminine products, shampoo, soap, paper towels, and toilet tissue will be collected through Dec. 31. For more information about the services offered by McMullin, Stone & Associates, call 770-471-6674 or email will.stone@mcmullinstone.com. Securities offered through Raymond James Financial Services, Inc. Member FINRA/SIPC. McMullin Stone & Associates is not a registered broker/dealer and is independent of Raymond James Financial Services, Inc. Investment Advisory Services offered through Raymond James Financial Services Advisors, Inc. Raymond James is not affiliated with the Real Life Center.